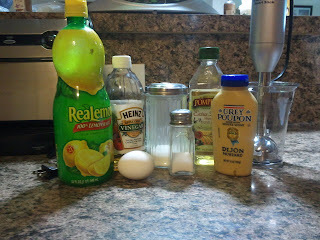 Robin's Eccentricities: Pinterest-Fool Proof Mayo-Or is it? The Pinterest test for today was Foolproof Mayonnaise. I had such high hopes. I wanted so much for this to work. We go through so much mayo and what a money saver this would be. Here is the 'pin' I tried. It seemed easy enough. 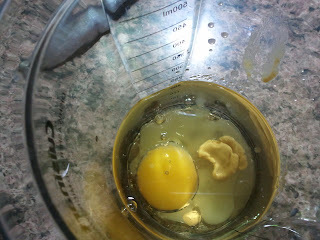 Put everything in and turn on immersion blender. Pretty basic stuff right? The recipe said to put it all in the beaker together. So I did. There it is. All floating around together. 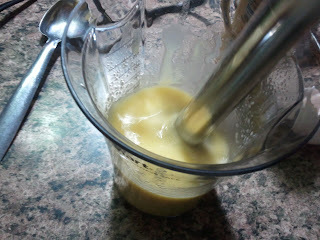 Then with immersion blender at the bottom turn the power on and in seconds it will become mayo. It mixed together. But it never formed into mayonnaise. I tried for 2-3 minutes to get it to whip into mayo. The video is terrible quality but the only way to show my end result. I won't give up. I am going to continue to work on making mayonnaise. It is now a personal challenge for me. Some things have taken more experimentation than others but I've always been able to make something. I'm off to search for more mayonnaise recipes. If you have one that works for you, please share with me and I'll feature it on the blog.